This story presents a q uick overview of the history of the Ripon area from when humans first in habited this valley to the present time. It is not an attempt to provide an extensive or comprehensive report. 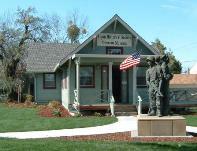 Many facts and interesting stories were left out because of the limited space, and you are encouraged to visit the Ripon Memorial Library for more thorough information. The first people to live in what is now the Ripon area were Native American pioneers, who probably arrived from the south more than 13,000 years ago. It was the end of the Ice Age and the Sierra and Cascade ranges were covered in glaciers. Native people continued to live here through a period of drier and warmer weather that spanned about 9,000 to 5,000 years ago. The ancestors of the Miwok-speaking tribes arrived in what is now San Joaquin County about 5,000 years ago and developed rich life ways that took advantage of the resources along rivers like the Stanislaus and around the Sacramento-San Joaquin Delta. The Miwok ancestors spread from this homeland about 2,000 years ago though the Delta, as far north as Sacramento, into the East Bay and North Bay Areas, and also the Sierra Nevada foothills. The Miwok ancestors were joined, in what is now the Ripon area (southern San Joaquin County), by Yokuts-speaking Indians about 1,000 years ago. When the Spanish first arrived along the northern California coast in the late 1770’s, the area that is now San Joaquin County had the densest population of Native peoples in all of North America, north of Central Mexico. That changed quickly as European diseases, to which American Indians had developed no immunities, began to spread into the Central Valley; eventually killing 90 percent of the Indians. At Missions San Francisco and Santa Clara, so many Indians died in the labor camps or ran away that the Spanish established Mission San Jose (1797) to bring Indians in from this area of the northern San Joaquin Valley. The first Spanish expeditions to the Ripon area were in the early 1800’s. By 1820, most of the surviving Indians of this area had been moved to Missions San Jose and Santa Clara. Mexico gained its independence from Spain in 1821. The first Americans to visit the Ripon area were trappers under the leadership of Jeddediah Smith. They trapped beaver along the Stanislaus River and other rivers near the Delta in late 1826 and early 1827. The Mexican government insisted they leave, so the American trappers went north into Oregon country. The success of the American trappers compelled the British Hudson’s Bay Company to send trapping parties to this area, starting in 1829. In 1832, Hudson’s Bay Company established its southern most camp at what came to be known as French Camp. The Indians along the Stanislaus River were friendly with the trappers. Unfortunately, trappers brought malaria from Oregon in the fall of 1832; the resulting epidemic killed many thousands of the Native people that remained in the Central Valley. In 1834, Mexico decided to break up the vast holdings of the missions along the coast. The remaining ranches relied on the labor of Native people and many Indians were captured in this area and forced to work on coastal ranches or in the houses of the ranch owners. Because of this, and their treatment at the missions, the Indians of this area decided to fight to keep the Mexicans from spreading into interior California. The Indian freedom fighters were led by Estanislao, who was a member of the Lacquisemine Yokuts-speaking nation and grew up in what is now the Ripon area. He was named Estanislao at Mission San Jose, after the Polish St. Stanislaus. The Mexican government put a price on Estanislao’s head and sent Mexican soldiers here to capture him in 1828 and 1829. The Indian patriots had built earthworks and stockades in the forest on the Stanislaus River and defeated the army twice. For the third battle, the Mexican government sent the largest army ever assembled in Hispanic California, under the command of Mariano Vallejo. During the third battle, the army set the forest on fire and the Indians had to retreat to a stronghold farther upstream. After more fighting, the Mexican army ran out of ammunition and returned to San Jose. These battles, probably not far from Ripon, were the most important military victories by California Indians against the Spanish or Mexicans. Estanislao was an important Indian leader and the Stanislaus River and adjacent Stanislaus County were named after him. A short time later, another Indian leader, named Jose Jesus, became a friend of Charles Weber. That friendship allowed Captain Weber to settle his land grant that included most of what became San Joaquin County, south of the Calaveras River. Education was a vital ingredient in building a good individual. The citizens of Dent and Castoria Township, which was to become Ripon, demonstrated this early on in the development of the public school districts. Zinc House School was the first step in this process; being formed in 1852. The schools needed to be accessible to students by horse or by foot. This was the reason for a high number of schools in the Ripon area. By 1890 Ripon had 4 schools, with a daily attendance of 108 students: River School 14, Zinc School 33, San Joaquin School 32, and Ripon School 29. In 1877 the first school in the town site of Ripon was in a small building next to the railroad tracks at Stockton Street. The building was not adequate and soon a new building was constructed north of the cemetery on Stockton Street. This school definitely had legs and on September 8, 1888 the school was moved to the corner of Walnut and Main Street. In August of 1911 a bond was passed and a new two-story brick schoolhouse was built at the corner of Main and Acacia Streets. The new school opened for class in 1912. In August of 1910, some of Ripon’s enterprising citizens got busy and circulated a petition to hold an election for a High School Board. The election results held 106 in favor to 35 opposed to a board. The District was organized in just one month. The school’s name was Ripon Union High School and it encompassed Ripon, River, San Joaquin and Zinc House School Districts. The first year of high school was held in 1910-1911 at Odd Fellows Hall. There were fourteen pupils and one teacher. A teacher’s salary in this time was $150.00 a month. A permanent school building was needed so a bond election was held in June of 1911 for $22,500, but it did not pass. Then in 1916, the third bond election was held and was approved with $27,000 for a new high school. The idea of Christian based education began on November 12th, 1924 through the work of Rev. John DeJong. He orchestrated the creation of The Society for Christian Instruction. The task of building a new school in a growing city was a formidable one. The location was 5 acres on Main Street and Vera Avenue, owned by Dr. Ned Gould and was purchased for $1,900. Now their attention was on the building and Mr. Lambert Ubels was given the task, with a budget of $5,155 to build a three-room schoolhouse. He started on May 4th and only four months later on August 29, 1928 The Christian School of Ripon was dedicated.